Family-friendly short treks through wooded areas. 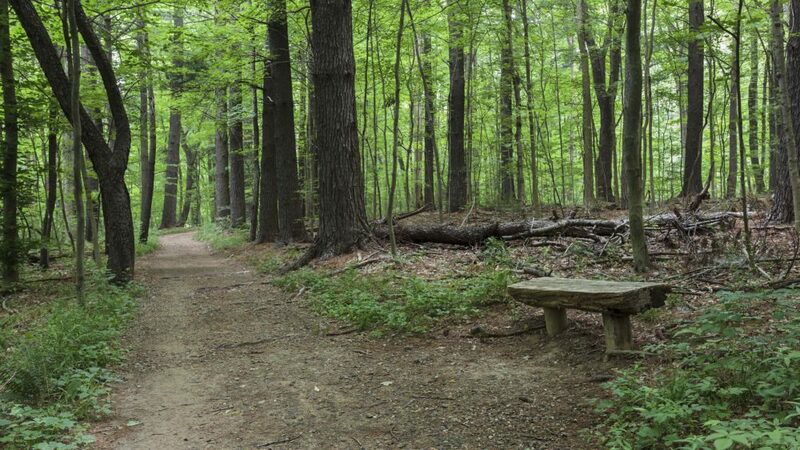 Near the Ritchie Ledges, the Pine Grove Trail mirrors the Ledges Loop at a moderate 2.2 miles in length. Most hikers can hike it in about 90 minutes. The nearby Forest Point Trail is a far easier half-mile and should take up to 30 minutes to trek. Both are accessible here via the Octagon Picnic Shelter, named for its shape. Like the Ledges Shelter, this space has a grill, limited electrical access and can be reserved for groups. Hikers and trail runners alike will love the scenic views and the opportunity to combine the trails for a longer route. From north or south, take I-71 to I-271 N to SR-303 exit. Continue east on SR-303 for 2 miles until you arrive in Peninsula. Turn right on Akron-Peninsula Rd. and take to Truxell Rd. Left on Truxell Rd. and continue past the Virginia Kendall Park entrance to Octagon Rd. Make a left on Octagon Rd. Park at the Octagon Picnic Shelter lot. Entrance to the park locations is free; fees for special programs, rentals and additional accesses may be required. By themselves or linked together, these are beautiful hikes, filled with deciduous greenery as well as hemlock, oak, wildflowers, switchgrass, and other foliage. While Pine Grove is moderately strenuous, it’s not steep or so perilous as to separate friends and family based on skill set. With the right footwear, everyone in your group can enjoy a hike or run here and still have plenty of time and energy to explore other sections of the park. For a full-day adventure, bring along a picnic and spend some time enjoying a meal together. What makes it great beyond that is versatility: the grounds are quite nice and make a great added value for any of the surrounding hikes you can take in. These are really family-friendly trails that cater to kids and beginners. Expert hikers have plenty around these two stops to take in that offer heft and cardio. If you like learning from your field guide, because there’s plenty of undisturbed prairie vegetation to look up here. People who want to build in more family time, picnicking, or frisbee into a day-long outing in the CVNP will love it. Outdoorsy families looking for a rental location for a family reunion spot are going to love it, too.